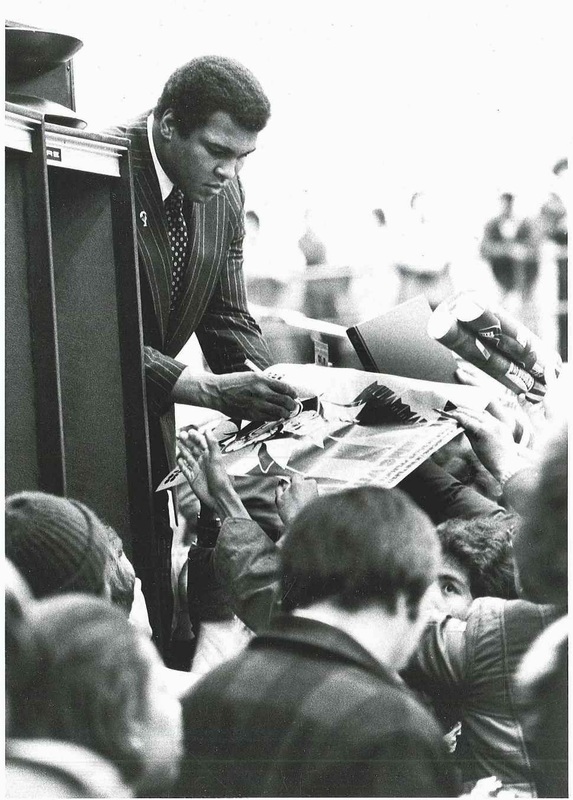 35 years ago, on Sunday, January 28, 1979, three-time heavyweight boxing champion Muhammad Ali came to Mount Pleasant to speak to a crowd of about 2,000 at Rose Arena on the Central Michigan University campus. Those in attendance who hoped to hear Ali tell of his greatest fights against Liston and Frazier, or Foreman and Spinks were in for something more than the boisterous oration Ali used in and around the ring. The champ certainly spoke about boxing, but he spoke more about motivation, success, his faith, and working to make the world a better place for all of its citizens. The 37-year-old Ali, who had regained the heavyweight championship just four months prior, mentioned projects he would tackle after his boxing career was over. His plans included starting an organization to bring equality to people across the globe. This organization, World Organization of Rights, Liberty, and Dignity, was founded by Ali in 1985. After speaking, Ali took time to greet students and sign autographs. Those who commented on his speech in the CM Life student newspaper mentioned how influential the presentation was (CM Life, January 31, 2013, p. 13, col. 1-3). Today, many still remember the event - it would be nearly impossible to forget the visit of one of the world’s most famous athletes. As a side note, Ali wasn’t the only celebrity that came to town that Sunday night in January. In order to get to Mt. Pleasant and other locations, Ali’s booking agency contacted Larry Newman, a Lear-jet-owning adventurer, to pilot the boxing champ during his lecture tour. Newman was famous in his own right. Just five months prior, Newman, along with Ben Abruzzo and Maxie Anderson, completed the first successful trans-Atlantic crossing by air balloon. The three sailed from Presque Isle, Maine to Miserey, France in the Double Eagle II. The gondola of their craft can be found resting in the Smithsonian’s National Air and Space Museum Annex today. But despite all of Mr. Newman’s success and his place in history, Ali was definitely the main event for Central students that evening (CM Life, January 31, 1979, p. 10). Bringing world-renowned guests to campus has always been part of the educational mission at CMU. 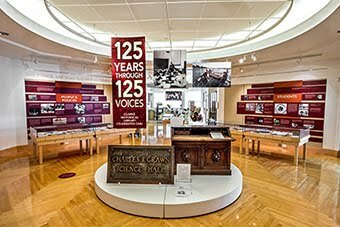 From Eleanor Roosevelt’s visit in 1955 to Colin Powell’s visit in 2013, CMU has worked to give students a chance to hear the leading voices in our society. Muhammad Ali was not in trunks and he didn’t have gloves on, but Central can always say that Rose Arena hosted a spectacular performance by The Greatest in front of an adoring crowd. We Said They Were Good, Not Good for You!